The DPH260TK automatic blister packaging machine is a newly developed, advanced piece of packing equipment we have developed here at Feiyun. It utilizes an integrated PLC control that combines frequency conversion, the machine, electricity, lights and gas. Its innovative design is in strict accordance with GMP standards, and features advanced functions, easy operation and a large production volume. 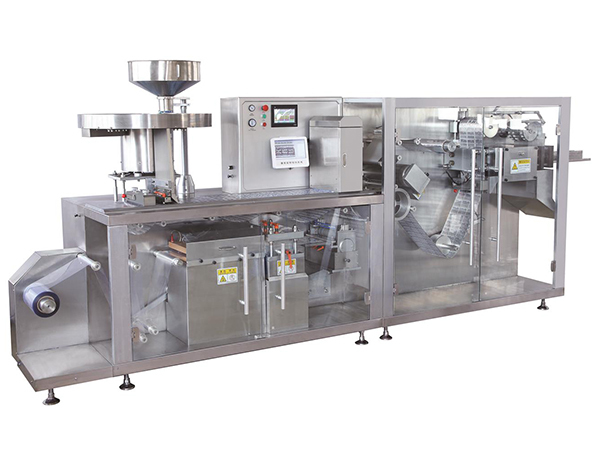 This packaging machine is suitable for packing medicine, food, health care products, cosmetics, hardware and more. The automatic blister packaging machine uses a top brand PLC controller with a touch screen display in Chinese and English, a frequency inverter for speed control, and servo traction to ensure the length of the blister traction is adjustable within the range. Several attractive features include a thermal temperature control and testing, main machine over load protection, PVC and PTP packing material position test, feeder material position test, automatic failure debugging and alarm, automatic protection and halt in operations. The machine station module design type includes a level frame, clear sight, and safe, convenient operation. Thermal with contact, positive press formed, air cushion thermal seal upper and lower net, as well as a photo register make your product packaging results better. PVC exchange support with a larger material support and a whole roller gives the packaging equipment more practicality. The special design includes molds in rectangular shapes and a ladder type fixed status, which gives the machine a convenient and easy mold replacement. All material contact components use high quality stainless steel and aluminum metal, as well as a slap-up surface treatment. Discharging of the finished product is done in the right order, and non-qualified products will be automatically collected, and automatic rewinding of the strap material occurs to ensure easy collection. Feeding is efficient, reliable and suitable for multiple types of product designs. The machine has been designed into separated body components, so that it can easily be moved or lifted into different places.